Biggest Risk to Your Retirement is Not Being Invested! The month of May was a very satisfactory one for the financial markets and one which, if you were invested, enjoyed a nice benefit. While there is extreme volatility on the financial markets and every day brings financial headlines of the upcoming disaster, there once again is really no economic evidence to support that case. While certainly equity markets are significantly higher than they were a few years ago, the international markets are now contributing positive gains, and the economic trends tend to be up not down. As I have written many times previously, as long as the three major components - earnings, interest rates, and the economy - are positive, equity markets are likely to perform to our advantage. I have a lot I want to cover in this post, but first it is important to evaluate the markets through the end of May. For the five-month period ending May 31, 2015, the Standard & Poor’s index of 500 stocks was up 3.2% for the year. Additionally, for the year, this index has returned a very healthy double-digit return of 11.8%. The Dow Jones industrial average is up 2% for 2015 and up 10.1% for the year ending May 31, 2015. Even the Russell 2000 small-cap stocks is up 4% in 2015 and up a very nice 11.4% for the one year period ended May 31, 2015. The real star in performance has been the NASDAQ Composite, which represents a great number of biotech and other tech type names; it is up 7.5% for the year and 20.8% for the one year period ended May 31st. As predicted in prior posts, the bond market continues to struggle and the volatility in that market has become almost unbearable. There is a very interesting phenomenon going on around the world. The entire financial world is covered up in cash and there is frankly a shortage of bonds to meet that ever-growing cash need. Since there are not many bonds being issued and there is no lack of investors clamoring to buy those bonds, the market has become very tight and the float on the bonds is very narrow. With interest rates almost assuredly going up, we think bonds should be an under-weighted investment at the current time. For 2015, the Barclays aggregate bond index is up a measly 0.8% and has returned 2.8% for the one year period ended May 31, 2014. A quick analysis tells you that the S&P 500 index has returned roughly 4 to 5 times the return on bonds over the same time-frame. 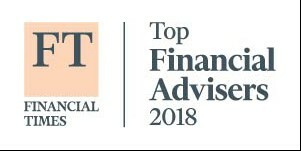 Before reflecting on current economic circumstances, I have to mention the significant honor we got this week by being named in the top 100 fee-only financial planners in the United States. Remarkably, we were rated number 20 in this list of 100. This is a unique honor in that we did not campaign, we did not apply for, and we certainly did not pay to be on this list. All of the information gained by the company rating the firms was from public records and from nothing we gave them. In order to get on this list, you have to be a fiduciary to your clients and you cannot charge commission or other fees to transact financial instruments for the clients. Since we only work on a percentage of total assets under management, we have no vested interest in recommending products, and therefore have a fiduciary responsibility to our clients to do what is best for them. I believe this is the wave of the future in financial planning. Fortunately, we were in the right category since day one, a long 25 years ago. 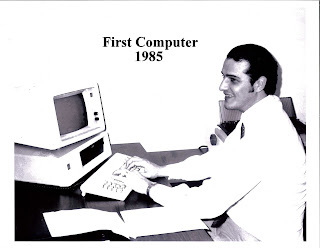 Also, I thought it was a good time to reflect on how I formed my financial counseling business back in the late 1980s. When I first got into public accounting, I would recommend that clients go to this stockbroker or that, this financial planner or that, in order to build on their retirement assets. I was greatly disappointed by the conflict of interest that I saw after these recommendations. Often times, I would see clients invested in funds that were totally inappropriate for them, yet with the full knowledge of the broker who recommended it. It took me years to precisely understand the biases that these brokers brought to the table. Also, I saw that these brokers and financial planners were not particularly astute in either financial, tax or insurance matters. It caused me a great deal of concern that I was recommending someone to my clients who clearly did not have their best interest at heart. They had no fiduciary responsibility to my clients at all. The final nail in that coffin of offering recommendations was one time when a fairly well-known and now famous stockbroker in Atlanta recommended a real estate investment to one of my clients. A few years later, the investment completely fell through and his $75,000 went to zero. When I called to complain to the broker regarding the poor quality of this investment, his exclamation was “Your client is a big boy; he should have known what he signed." With that statement, I was then determined to do better by my clients. At the beginning of 1990, I sent out a solicitation letter looking for anyone who wanted to invest money with us through our new financial counseling company. Remarkably, the next week, people mailed me checks to invest. Beginning with basically zero, we built this financial planning company from scratch, and it was certainly not an overnight sensation. But 25 years later, our long, hard struggle paid off and was recognized when we received this outstanding honor last week. 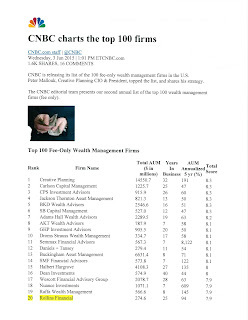 Interestingly, we have close to 50 clients that have been with the investment company since its very beginning. It is fairly amazing that they have stuck with us through the good times and bad times of the past 25 years. I think it also is a tribute to the fair play and good performance we have enjoyed over this time span. Pardon that short path down memory lane, but I wanted to explain more about how we got where we are today. While certainly we are most honored to receive this recognition, it is not without a lot of hard work over the years. As we sit here today based in Atlanta, Georgia, we currently manage over $300 million with clients virtually all over the United States, in Europe and Indonesia, with actually double-digit client representation in Los Angeles. Of course, we would not be there without our clients who support us, and we most assuredly appreciate you allowing us to manage accounts on your behalf. There is a lot going on in the world, and much of it is extraordinarily frightening. Yes, we have the problems in the Middle East the financial crisis of Greece, and clearly we have political discourse in the United States. However, all of that is a smokescreen for investing. You should never lose sight of the bigger picture. Underneath the turmoil of the world, you have to decide what is really important. Sometimes I classify investing as the best house in a bad neighborhood, but there is always a good market somewhere. While interest rates are clearly increasing, the level is only marginal and is almost laughably small. I think there is a good chance that the Federal Reserve will increase interest rates in 2015 by 0.25 of a point. Even at that level, they will be at historic lows and certainly not at a level to hurt the economy. While earnings are down year-over-year, it is principally due to the energy sector. If you exclude the energy sector from corporate earnings, they are actually up year-over-year and in some classifications are extraordinarily strong. In Europe, they are posting a first quarter GDP growth for the first time in many years. The economy in Europe is slowly gaining traction, and it has a governing body that will do anything to keep it on upward trajectory. All over Asia, you are seeing the economy pick up and things improve. We are now seeing new production coming out of China and increasing productivity in Malaysia, Indonesia and Vietnam. There is so much good going on in Asia, but it is unfortunately overshadowed by the political unrest in China and the hard feelings the U.S. has with its Asian comrades. Clearly, the economy in the U.S. is on the upswing, however, you would not know it by reading the financial press. There is amazing growth taking place in manufacturing with the durable manufacturing index up 2.7% year-over-year. It is hard to believe the upswing that is occurring in construction. Building contracts are up close to 30% year-over-year and housing sales are up close to 9%. Even the home price index is up 4.75% for the year-over-year comparison. That is good news for everyone who owns a home. All of this is surprising given that the GDP growth was reported as negative in the first quarter. There seems to be a lack of connection between the GDP indicator and everything you see around you. Employment is clearly up for the year, increasing almost 3 million jobs in the last year. Unemployment at 5.5% is actually quite good. When I was in college, we were taught that 5% unemployment was considered to be full employment. Therefore, I see the economy as continuing to strengthen in spite of the dire headlines you read everywhere. Therefore, the three major indexes that leads to higher stock prices are firmly in place and I do not see that changing over the next few months. You always have to say that a 10% correction in the equity markets could occur at any time. Due to the vast day-trading and momentum traders that we now see trading stocks, there need not be a particular reason to force the market in either direction. They systematically move stocks based upon whims, not economics. We invest, we do not speculate. We base our investment criteria on hard economic data, not current trends or sentiment- unbiased in economic reality. Every day, we hear from clients who express their fear that we are going to fall into the 2008 financial abyss. It does not take a group of economists to compare the economy in 2008 with the economy in 2015 and know that they have no similarities whatsoever. In the area of predictions, I have another one this time. I am not exactly sure when, but I feel fairly confident that there will be a big leg up in this financial market sometime before the end of the year. It rarely happens in the summer, but it could. More likely, it will be in the fall when everyone is back at work and not enjoying vacation. You could see a major upward move during one month in the financial markets that would make the entire year 2015 very rewarding. I reflect on that fact, knowing full well that there are many people reading this financial blog that are underinvested. I see clients everyday sitting on substantial sums of cash earning virtually zero. Given that the financial markets have had double-digit returns for the last three years, sitting on cash has been a losing proposition. While certainly volatility is likely to continue, the trend is clearly up and if you are not participating, you need to be. As we roll into the summer months, we have plenty of time to sit down and go over your financial goals and learn more about your financial life. We encourage you to sit down and visit with us and let us understand your goals, concerns and how we can work to build you a better retirement. Retirement is not built in a day, a week or a month. It is built over long years of investing, saving an understanding how money is made in the financial markets. In closing, in 2015 the largest risk to a safe and sound retirement is not being invested or even being significantly underinvested, like many of you reading this blog. We’ve been telling you this for years, and it has finally been affirmed....In all seriousness, thank you for your loyalty!! We could not have done it without you! 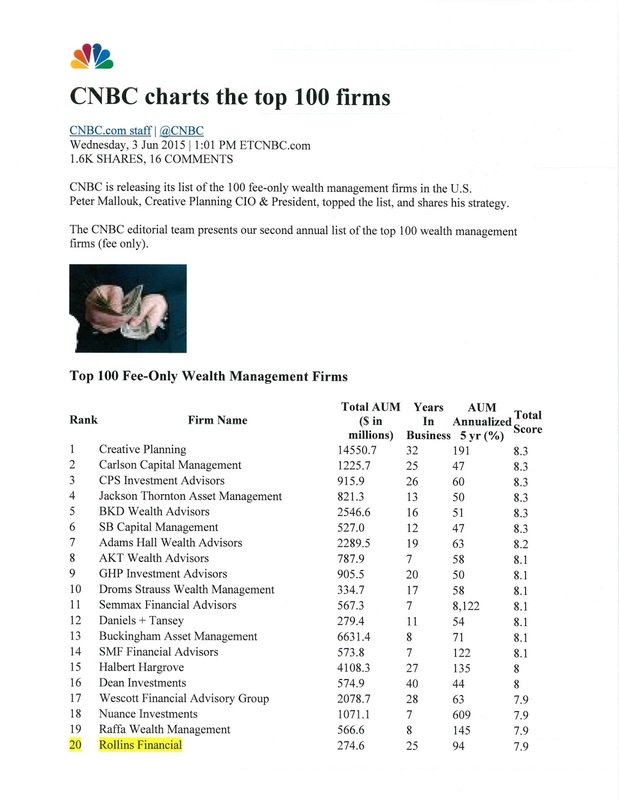 “CNBC presents its list of the top 100 wealth management firms (fee only) in the U.S. for 2015” – and Rollins Financial, Inc. is #20!